The objective of this blog is to explain how to convert material quantity unit into base unit or another alternative unit of measure as per MARM table (defined in material master). Requirement is to fetch material quantity from a DB table and then display that quantity on screen. But the unit of measure in which material quantity needs to be displayed on UI can be different than the unit of measure in which it is saved. The standard quantity conversion function ‘UNIT_CONVERSION’ which is provided in CDS can’t be used in this case as it performs the unit conversion based on the rules stored in transaction CUNI and in the database tables T006. But in our scenario, we need to perform material quantity conversion based on the alternative unit of measures defined in material master (available in MARM table). Alternate Unit of measure maintained in material master are: ‘PC’ (Piece) & ‘PAL’(Pallet). 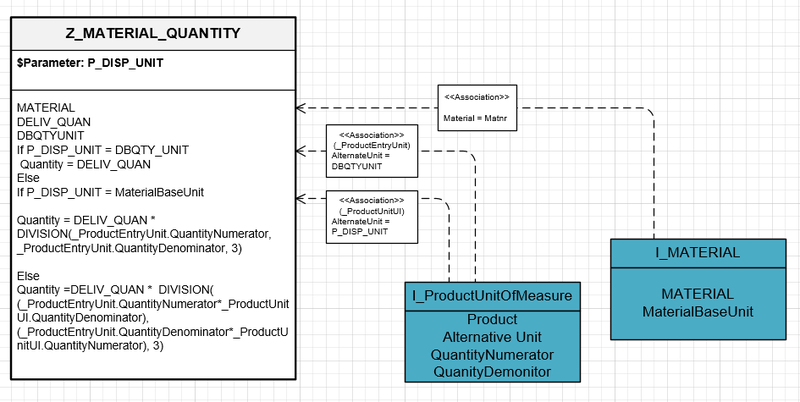 In CDS view, quantity will be fetched from database table & then it will check if the Unit of measure in which quantity needs to be displayed on UI is different from unit of measure stored in database table, then it will get the conversion formula maintained (in MARM) using associations on standard CDS view I_PRODUCTUNITSOFMEASURE. Therefore the quantity will be converted to the base unit of measure and then it will be converted from base unit of measure to the display unit of measure. Create a CDS view and fetch the quantity data from the DB table. In that CDS view make an association on SAP standard CDS view I_MATERIAL (CDS view for MARA table) to get the material base unit of measure. Two times Association or Left outer join on I_PRODUCTUNITSOFMEASURE (Standard CDS view of MARM table) using key Material and unit of measure. One with the Display Unit of measure and one with unit of measure in which quantity is stored in DB. Execute the CDS View & provide Display Unit of Measure (In which unit result is required). In our case we are providing ‘ST’ (which is internal format for ‘PC’ Piece). The material quantity is successfully converted into Piece from Pallet. 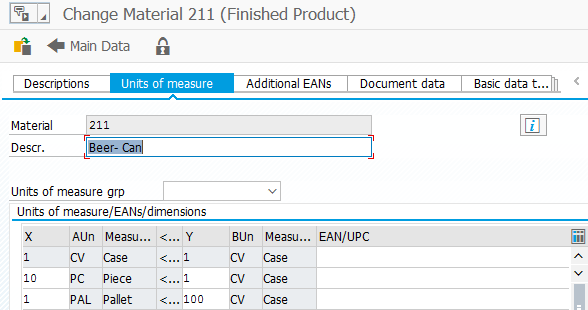 All unit of measure’s (Base as well as alternative) in which quantity conversion is required should be maintained in material master. Cool stuff. Straight forward example. Excellent blog and a very good example of currency conversion!